Insulated jacket achieves warmth in cold, wet weather. Color: Blue. Internal elastic cuffs. 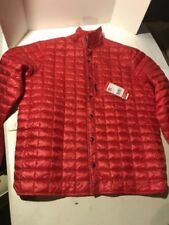 NWT The North Face Thermoball Hoodie Jacket MEN TNF Red/Sequoia Red Size LARGE!! The North Face Thermoball Hoodie Jacket. TNF Red/Sequoia. Size Large. 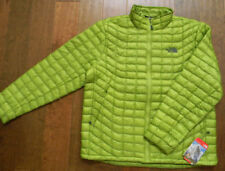 Mens Small North Face Jacket. Condition is Pre-owned in Excellent Condition! Shipped with USPS Priority Mail. Thermoball insulation technology. Fixed hood with elastic sides. The North Face. Size LARGE: across 21 " (armpit to armpit), 28" length (top of shoulder to bottom of jacket), 26" sleeve length (shoulder seam to bottom cuff). Slim fit easily layers under a ski jacket or shell. Item Condition: 2.5 out of 5. Type: Insulated hoody. Fit: Regular. We serve as an outlet for the cycling and outdoor community to turn over their no longer needed gear. We believe that no usable gear should be thrown out or neglected, it should be enjoyed by a new user. PrimaLoft ThermoBall insulation mimics the look and feel of down, trapping warmth to keep you warm while you're on the move. It even compresses down so you can stow it in a pocket and take it with you wherever you go. This jacket also features zippers under each arm for ample ventilation. Removable liner uses Primaloft Thermoball for down-like insulation. [face fabric] 100% nylon taffeta, [insulation] (body) Primaloft Thermoball, (sleeves) Primaloft Silver Eco (60g). The secret to its season-long versatility is the pairing of a waterproof shell with an insulated liner jacket. The outer shell is crafted with a wind- and waterproof DryVent fabric to ward off winter gales and heavy snow, and it's designed with a slightly longer cut for optimal coverage against harsh conditions. NWT The North Face Men's Thermoball Vest. Black. Style # T9382CMDW. Thermoball insulation technology. Color: Urban Navy Stria (Navy Heather). Size XL: across 23 " (armpit to armpit), 29" length (top of shoulder to bottom of jacket), 27" sleeve length (shoulder seam to bottom cuff). The North face thermoball Vest XL Mens. The Color Is Conquer Blue. NEW!! The North face thermoball Vest XL Mens. The Color Is Conquer Blue. NEW!!. Condition is New with tags. Retail $149.Shipped with USPS Priority Mail. One day auction!!! Shipping in U.S 48 only! Please ask all questions before bidding or buy it now. Open to offers as well. Thermoball insulation technology. Size XL: across 23 " (armpit to armpit), 27" length (top of shoulder to bottom of jacket), 26" sleeve length (shoulder seam to bottom cuff). Fixed hood with elastic sides. As compressible as down, the ThermoBall™ clusters trap and retain heat within small air pockets to provide effective insulation, even when wet. Attached fully adjustable hood. Exposed molded-tooth front zip. •TNF Black / Black. Taffeta bomber jacket with durable, water-resistant finish. •Internal chest pocket. •Ribbed baseball collar, cuffs, and hem; zip front. Zip pocket and raised logo at left sleeve. The North Face | Thermoball Full-Zip Jacket | Large | Silver/Gray/Grey. UNUSED, CLEAN, and NOT A SECOND. Thermoball insulation technology. Size XL: across 26 " (armpit to armpit), 29" length (top of shoulder to bottom of jacket), 28" sleeve length (shoulder seam to bottom cuff). The North Face. Exposed center front zip. 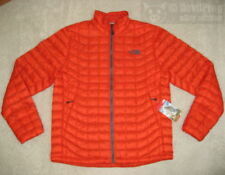 The North Face Thermoball Jacket, Men’s M. Condition is Pre-owned. Good condition but has two holes on the bottom left side in the back (see last photo). Still has plenty of life in it. Sold in “as is” condition, please as if there are any questions. No returns. 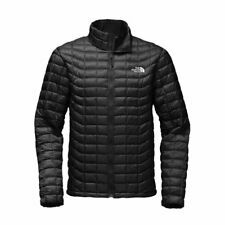 The North Face Men's Thermoball Hoodie INSULATED Jacket. Independent clo testing by Kansas State University has shown that ThermoBall has warmth equivalent to 600 fill goose down. Standard Fit. Lightweight, durable VISLON center front zip. Covered, secure-zip hand pockets. 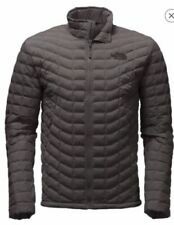 NEW THE NORTH FACE Men’s Thermoball Insulated Jacket Size Large. Shipped with USPS Priority Mail. The North Face Thermoball Pullover. Listed Size: XL. Excellent used condition! Ships priority! See pictures. Awesome! Poly fill XL. NWT The North Face Men's Thermoball Vest. Deep Garnet Red. Style # T0A3X5DYY. Size LARGE: across 22 " (armpit to armpit), 28" length (top of shoulder to bottom of jacket), 27" sleeve length (shoulder seam to bottom cuff). Body/sleeve/hood lining: 100% Nylon. Shell: 100% Polyester. No defects at all, nearly mint condition. I do not go to a climate that requires this type of jacket to get enough use out of it. DryVent™ 2.5L shell and a removable ThermoBall™-insulated inner jacket. Attached, fully adjustable hood. Waterproof, breathable, seam-sealed DryVent™ 2.5L shell. Concealed secure-zip chest and hand pockets. PrimaLoft® ThermoBall™ insulates in wet, cold conditions. For technical layering at its best, this highly breathable, insulated hybrid backcountry jacket is specifically designed to be layered under our Steep Series jackets.